"The Judgment of God" are scary words for most people. Partly this is due to the Church portraying Judgment as a horrible and fearful thing involving sentencing many to an eternity of insane torture by fire. We will now take a Scriptural look at the doctrine of Gehenna Fire Judgment. "...shall not the Judge of all the earth do right" (Gen. 18:25). Actually this phrase is: "shall not the Judge of all the earth do justice." "Justice" is translated from the Hebrew mishpat and it means according to Dr. Strong: 'a verdict-favorable or unfavorable.' And our dictionaries add to this: "a quality of being just; fairness." So "justice" is "just and fair" (interestingly John Hagee teaches that an eternity of torture in a literal hell of literal fire is "JUSTICE," and Dr. James Kennedy teaches that hell is "FAIR"). NO, an eternity of torture in fire is not "justice," nor is it "fair," as these two great pillars of heresy contend. The word "Judge" in this verse is from the Heb: shaphat and means according to Dr. Strong: "judge, to pronounce sentence-to vindicate or punish." "Because He [God] has appointed a day, in the which He will judge the world in righteousness..." (Acts 17:31). Notice that Jesus will  judge,  the world,  in righteousness. "When Thy  judgments are in the earth, the inhabitants  of the world  will learn righteousness." What a marvelous spiritual match. When Jesus Judges the world in righteousness, the world will "learn righteousness." "For I know him, that he will command his children and his household after him, and they shall keep the way of the Lord, to do justice and judgment; that the LORD may bring upon Abraham that which he hath spoken of him" (Gen. 18:19). Here we learn that doing "justice and judgment" brings the blessings of God. Will Jesus and God His Father do the "right" and just thing when it comes to judging this world? Certainly. In the Old Testament we read that God does not change (Mal. 3:6); God the Father does not change (James 1:17); Jesus Christ does not change (Heb. 13:8). Use your God-given minds for a moment and consider the insanity of infinite punishment for finite sins, and the same punishment for both gross and minor sins. "But the fearful [Gk: timid] , and unbelieving, and the abominable, and murderers, and whoremongers, and sorcerers, and idolaters, and all liars, shall have their part in the lake which burns with fire and brimstone: which is the second death" (Rev. 21:8). Does anyone in their right mind believe that murderers and timid people should be sentenced to the same "eternity of punishment?" Why even most heathen governments match the punishment to fit the nature and degree of a crime. But most Christian theology does not have even the good sense of some pagans. Even when "many stripes" were administered (even among wicked men), they were to be limited to 40 lashes: Deut. 25:3; Lk 12:47; Acts 16;23; II Cor. 11:24. To "judge" means to set right, whether it is in chastening or sentencing. "Shall not the Judge of all the earth do right"-that is to judge justly so as to bring about change. "When Thy [God's] judgments are in the earth, the inhabitants of the world [everyone] will learn righteousness" (Isaiah 26:9). When the wicked are left to their own devices, they will NOT learn righteousness, but when God's just judgments are added to the mix, and Jesus judges in righteousness, they cannot but "learn righteousness." Why won't the Church teach these marvelous truths? Well, of course it can't, seeing it is deceived. "They shall not hurt nor destroy in all My holy mountain: for the earth shall be full of the knowledge of the Lord, as the waters cover the sea" (Isa. 11:9). It is an easy thing to turn men (and women) into beasts and heartless criminals. Torturing them or annihilating them would likewise be an easy thing for God to do. But turning vile and demented criminals like Hitler, Saddam, or Charles Manson into godly saints, now that's an accomplishment. Of course most Christians and theologians and pastors do not believe that God is up to a task this great. Just wait. If God can spiritually transform a criminal like the Pharisee Saul, into the loving Apostle Paul, Saddam and the boys will not challenge God's ability to convince them of their great need of repentance. We have already stated many times at bible-truths that God not only judges our sins and wrong deeds, but also our carnal heart; our very thoughts and emotions. Yet there is another form of judgment God administers to us that I doubt many Christians have ever equated with judgment, and I want to cover it here. No, not this strange spoof on judgment. 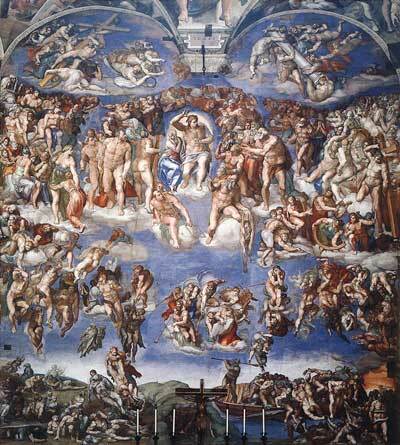 This is Michelangelo's imagination of what The Last Judgment might look like. Even the pope was not too happy with this rendition, however, they opted to keep it anyway. God's judgments on His Church are carried out during their lifetime (with their clothes ON). And we all know what chastening is. We know that Jesus uses His spiritual "judging," spiritual "council," spiritual "Gehenna fire," and spiritual "prison," to chasten us and correct us and perfect us. But there is yet another judgment of God upon His people that I do not believe most have ever seen as a judgment of God. "That no man should be moved by these afflictions: for yourselves know that we are appointed [appointed by GOD] thereunto. For verily, when we were with you, we told you before that we should suffer tribulation; even as it came to pass, and you know." "So that we ourselves glory in you in the churches of God for your patience and faith in all your persecutions and tribulations that ye endure: Which is a manifest token of the righteous JUDGMENT of God, that ye may be counted worthy of the kingdom of God, for which ye also suffer." Wow, here Paul plainly tells us that "...persecutions and tribulations... IS... the righteous Judgment of God..." Judgments are not always bad things that come upon us for committing sins. Judgment also involves trials, tests, persecution, tribulation, and many such things that sometimes makes life very difficult and uncomfortable, but also qualifies us to "...be counted worthy of the Kingdom of God." "O the depth of the riches both of the wisdom and knowledge of God! how unsearchable are his judgments and his ways past finding out!" (Rom. 11:33). "Judgments" from God are wonderful things. Too bad we don't appreciate them. "And I heard another out of the altar say, Even so, Lord God Almighty, true and righteous are Thy judgments" (Rev. 16:7). It is not by escaping tribulation that we enter God's Kingdom (as in the unscriptural rapture theory), but by going " through much tribulation." Does Chuck Smith have a chapter and verse on that bit of heresy? No, of course not. We do, however, have a Scripture that demolishes such heresy. "Immediately after [does everyone understand the difference between 'before' and 'after?'] ...immediately after the tribulation of those days.... He [Jesus] shall send His angels with a great sound of a trumpet [I Cor. 15:52] , and they shall gather together His elect [for the first time, I might also add] from the four winds, from one end of heaven to the other" (Matt. 24:29 & 31). One other major point: Clearly this verse and others show that Christ returns " after the tribulation of those days." "But in those days, after the tribulation... shall He send His angels, and shall gather together His Elect..." (Mark 13:24 & 27). The days of "great tribulation" end at Christ's presence, and the day of "His wrath" begins at His presence. They are two separate and different events, and different judgments on different people for different purposes. If you have not seen or do not understand the absolute differences in Scripture between tribulation and affliction versus wrath and indignation, then be sure to read my ten-page section dealing with it in detail, in my paper "Exposing the Secret Rapture Theory." "When thou [God's people] art in tribulation, and all these things are come upon thee, even in the latter days, if thou turn to the Lord thy God, and shall be obedient unto his voice" (Deut. 4:30). "Go and cry unto the gods which ye have chosen; let them deliver you [God's people] in the time of your tribulation" (Judges 10:14). "And, behold, as thy life was much set by this day in mine eyes, so let my life be much set by in the eyes of the Lord, and let him deliver me [God's servant] out of all tribulation" (I Sam. 26:24). "For then shall be great tribulation [when] 'they deliver you [God's Elect] up to be afflicted...' Ver. 9] , such as was not since the beginning of the world to this time, no, nor ever shall be" (Matt. 24:21). "Immediately after the tribulation [that must be 'endured unto the end' by God's Elect, Ver. 13] of those days shall the sun be darkened, and the moon shall not give her light, and the stars shall fall from heaven, and the powers of the heavens shall be shaken" (Matt. 24:29). "But in those days, after that tribulation [same as Matthew's account] , the sun shall be darkened, and the moon shall not give her light" (Mark 13:24). "These things I have spoken unto you [Christ's disciples] , that in me ye might have peace. In the world ye shall have tribulation: but be of good cheer; I have overcome the world" (John 16:33). "Confirming the souls of the disciples, and exhorting them to continue in the faith, and that we [God's Elect] must through much tribulation enter into the kingdom of God" (Acts 14:22).
" Tribulation and anguish, upon every soul of man [first time the world is included with God's people in tribulation] that doeth evil, of the Jew first, and also of the Gentile" (Rom. 2:9). "And not only so, but we [God's Elect] glory in tribulations also: knowing that tribulation works patience" (Rom. 5:3). "Who shall separate us [God's Elect] from the love of Christ? Tribulation, or distress, or persecution, or famine, or nakedness, or peril, or sword?" (Rom. 8:35). "Rejoicing in hope [God's Elect] ; patient in tribulation; continuing instant in prayer" (Rom. 12:12). "Who comforts us in all our [God's Elect] tribulation, that we may be able to comfort them which are in any trouble, by the comfort wherewith we ourselves are comforted of God" (II Cor. 1:4). "Great is my boldness of speech toward you, great is my glorying of you: I am filled with comfort, I am exceeding joyful in all our [God's Elect] tribulation" (II Cor. 7:4). "For verily, when we were with you, we told you before that we [God's Elect] should suffer tribulation; even as it came to pass, and ye know" (I Thes. 3:4). "Seeing it is a righteous thing with God to recompense tribulation to them [our enemies] that trouble you [God's elect] " (II Thes. 1:6). "I John, who also am your brother [God's Elect] , and companion in tribulation, and in the kingdom and patience of Jesus Christ, was in the isle that is called Patmos, for the word of God, and for the testimony of Jesus Christ" (Rev. 1:9). "Fear none of those things which you shall suffer: behold, the devil shall cast some of you into prison, that you may be tried; and you [God's Elect] shall have tribulation ten days: be you faithful unto death, and I will give you a crown of life" (Rev. 2:10). "Behold, I will cast her into a bed, and them [God's Church] that commit adultery with her into great tribulation, except they repent of their deeds" (Rev. 2:22). "And I said unto him, Sir, you know. And he said to me, These are they [God's Elect] which came out of great tribulation, and have washed their robes, and made them white in the blood of the Lamb" (Rev. 7:14). And so the Scriptures prove conclusively that tribulation, first and foremost, is administered to the Church; the House of God; God's Chosen Elect. And so we are brought into Christ's "judgment" [Gk; 'judging'], high counsel, Gehenna fire, and prison. We are also taken through great tribulation. And along with all these we are to go through a plethora of spiritual transformations . And just what might these be? "And said, Verily I say unto you, except you be converted, and become as little children, you shall not enter into the kingdom of heaven: (Matt. 18:3). "Jesus answered and said unto him, Verily, verily, I say unto you, Except a man be born again, he cannot see the kingdom of God... Verily, verily, I say unto you, Except a man be born of the water and of the Spirit, he cannot enter into the kingdom of God" (John 3:3 & 5). "...but according to His mercy He saved us, by the washing of regeneration and renewing of the Holy Spirit" (Titus 3:5). "...you were sealed with the Holy Spirit of promise, which is the earnest of our inheritance until the redemption of the purchased possession, unto the praise of His glory" (Eph. 1:13-14). "But of him are ye in Christ Jesus, who of God is made unto us wisdom, and righteousness, and sanctification, and redemption" (I Cor. 1:30). "Whom God hath set forth to be a propitiation through faith in his blood, to declare his righteousness for the remission of sins that are past, through the forbearance of God" (Rom. 3:25). There are dozens and dozens of such Scriptures. What do they mean? Who would like to explain in Scriptural detail the meaning of that last one to me? The Bible is just filled with such talk. Who really understands it? Do all of those complicated phrases with such large words really have any meaning to most Christians? In one of my favorite movies, "Amadeus," Emperor Joseph, whom Salieri (the court composer in Vienna) says, "has no ear at all for music," extols Mozart with reserved compliments for his new composition and then offers this criticism to make it better: "Too many notes" he observes. "Take out some of the notes and it will be just fine." "Just which notes did you have in mind," queried Mozart. The puzzled Emperor admitted he didn't know, but that he should just take some of notes out, and it would be fine. Mozart persisted that his composition had neither too few nor too many notes. Should we desire to have some of them taken out? Or are they all necessary? ...whoooooa! Words, words, so many words. Why so many difficult words? I used to wonder what they could all possible mean to a country boy like me from the Pocono Mountains. Am I the only one who has ever felt overwhelmed by so many pious and spiritually sounding "Bible words?" Well just as Mozart defended the precise number of notes that his composition needed, I am going to defend now all those long and difficult sounding words used in the Bible to describe the process of our salvation through judgment. But I am going to simplify this maze of long and difficult words and the spiritual meaning and application to our lives, so that you will never be intimidated by them again. God is ONE. We are to keep the unity of ONE. All Believers are to be ONE in God. The Scriptures are ONE. The parables are all ONE parable. And now I want to show that all of these words (in the final analysis) mean the same thing-CHANGE! "For whom He did foreknow, He also did predestinate to be conformed to the Image of the Son, that He might be the Firstborn among many brethren" (Rom. 8:29). "And creat ing is God humanity in His Image" (Concordant Literal Old Testament). "Confirming the souls of the disciples, and exhorting them to continue in the faith, and that we must through much tribulation enter into the Kingdom of God" (Acts 14:22). The word tribulation in this verse comes from Strong's #2347 , thlipsis and it means: " pressure (literally or figuratively): - afflicted, (-tion), anguish, burdened, persecution, tribulation, trouble." One more: the word must in this verse comes from Strong #1163, dei and it means " necessary (as binding): - behooved, be meet, must (needs), (be) need (-ful), ought, should." So let's put them together: In order to "enter into the Kingdom of God" we must as absolutely necessary and behooving and needful, be burdened with much pressure, affliction, anguish, persecution, tribulation, and trouble. Wow! They don't teach this stuff in Sunday school...or church...or seminary. When God calls one to be a son in His Kingdom, He puts them into a Spiritual Pressure Cooker. This is needful; this is necessary; this must be done. "My brethren, count it all joy [Gk: 'fullness, cheerfulness, gladness, calm delight'] when you fall into various temptations [trials] Knowing this, that the trying of your faith produces patience. But let patience have her perfect work, that you may be perfect, and entire, lacking nothing... Blessed is the man that endures temptation: for when he is tried, he shall receive a crown of life, which the Lord has promised to them that love Him"
"My sons, despise not the chastening of the Lord, nor faint when you are rebuked of Him: For whom the Lord loves He chastens, and scourges every son whom He receives. If you endure the chastening, God deals with you as with SONS; for what son is he whom the father chastens not? But if you be without chastisement, whereof all are partakers, then are you bastards, and not sons" (Heb. 12:5-8). The Christian sinner's prayer: "I hate my sin and I accept the Lord, Amen" won't cut it in the real world. If we desire to be sons and not bastards , then there is much work to be done and accomplished by our God in our lives. God does not create sons in His Spiritual Image by magic or ten second prayers. Here then is part of the process and the words used to describe that process of changing carnal human nature into the Spiritual Image of God, which we call salvation . The very first word to humanity out of Jesus' mouth after being tempted by Satan in the wilderness was "repent..." (Matt. 4:17). And what does "repent" mean? It means to change. And what have I been teaching since we started bible-truths.com? That God is changing physical, carnal humanity into the spiritual Image of God. That's what our existence is all about. This is the purpose for humanity. This is the next goal in the plan of God. To make carnal, physical humanity into the Spiritual Image of God. It's all about change. God is going to change the entire human race. And once you understand this first word "repentance," you will understand the other spiritual and pious sounding words of Scripture. They all involve change-changing from what we are into what God is. This word repentance sets the stage for all other commandments and admonitions regarding a change from what we are to what we should and MUST BE. We are to turn from our carnal human nature and sin, to God's spiritual love and righteousness. It is God Who will change us from what we are to what He is. God is creating humanity into the very Spiritual Image of Himself (that is what it's all about). This is the enigma of the Scriptures. This is the great parable of the Bible. This is the purpose for creation. This is the destiny of mankind. This is God's master purpose. This will be God's greatest accomplishment. This will be the Crowning Masterpiece of God's eternal wisdom, power, and love. God is calling you and me to this awesome journey! TRANSGRESSION: "Whosoever commits sin transgresses also the law: for sin is the transgression of the law" (I John 3:4). Strong's #458, " anomia, illegality, violation of law, wickedness, iniquity, transgression of law, unrighteousness." Numerous translations use the word "lawlessness." We learned the meaning of repentance, and now we learn what it is that we are to repent of: lawlessness, wickedness, unrighteousness, etc. Once again, it is a change. We talk about a "changed man." What do we mean by that phrase? Well, for one thing we mean he doesn't do the bad things he used to do, hence he is a "changed" man. CONDEMNATION : "And this is the condemnation, that light is come into the world, and men loved darkness rather than light, because their deeds were evil" (John 3:19). Strong's #2920, " krisi a tribunal, justice (specifically divine law): - accusation, condemnation, damnation, judgment." Our transgression brought us into a legal tribunal with God. It put us under legal Condemnation or judgment. But since we changed and repented of our transgressions, God has changed His judgment against us, hence we read: "There is therefore now NO condemnation to them which are in Christ Jesus, who walk not after the flesh [who changed] , but after the Spirit" (Rom. 8:1). How great is that! What brought about this change? DAMNATION: Translated from the same Greek word krisi translated condemnation above, and also translated as "judgment" dozens of times in Scripture. Many translations have dropped the word damnation from their Versions altogether. REMISSION : "For this is my blood of the new testament, which is shed for many ['Christ died for our sins' I Cor. 15:3] for the remission of sins" (Matt. 26:28). Strong's #859, " aphesis , freedom (figuratively) pardon, deliverance, forgiveness, liberty, remission." What changes us from being under condemnation for sin, is Jesus Christ's shed blood at the cross which sets us free, forgives us, and delivers us. How big of a change is that. PROPITIATION: "And he is the propitiation for our sins: and not for ours only, but also for the sins of the whole world" (I John 2:2). Now there's a word you don't see every day. Strong's #2434, "hilasmos, atonement, an expiator [one or makes amends, reparations], atones, propitiation." It means to bring in harmony with and appease. Jesus sacrificed Himself as a atonement, as a covering for our sins so that we are no longer spiritually naked before God. And not only has He done this for His chosen Elect, but also "for the sins of the whole world." The change that God is making in us he will extend to the entire human race. "Much more then, being now justified by his blood, we shall be saved from wrath through him" (Rom. 5:9). JUSTIFICATION : "Much more then, being now justified by his blood, we shall be saved from wrath through him" (Rom. 5:9). One more, "Therefore as by the offence of one judgment came upon all men to condemnation; even so by the righteousness of one the free gift came upon all men unto justification of life" (Rom. 5:18). Strong's #1347 " dikaiosis, acquittal, justification." "Acquittal is the state of being found not guilty." Christ's sacrificed blood on the cross changed us from being death-doomed guilty sinners to a state of being found " justified-not guilty of anything." How great a change is that in our lives. INDIGNATION: "But unto them that are contentious, and do not obey the truth, but obey unrighteousness, indignation and wrath" (Rom. 2:8). Strong's #2372, " thumos passion, fierceness, indignation, wrath." There are several words translated indignation, but they basically mean the same thing. Interestingly, indignation is defined as "wrath" and wrath is defined as "indignation." Notice that in our first verse on "justification," we learned that being justified saves us from wrath. That is because God is CONCILIATED to the world, and we who answer are RECONCILIATED to God through Christ which is our PROPITIATION for sins, thus our sins are REMITTED and forgiven leaving us JUSTIFIED and under no CONDEMNATION, thus we will not be appointed to INDIGNATION/WRATH (I Thes. 5:9). As we begin to grow in grace and in knowledge there are numerous terms used to describe our spiritual walk with God, which we will look at next. REFORMATION: " Which stood only in meats and drinks, and divers washings, and carnal ordinances, imposed on them until the time of reformation" (Heb. 9:10). Strong"s #1357, diorthosis, to straighten thoroughly, rectification, that is, (specifically) the Messianic restoration-reformation." A reformation requires a New Covenant. A new and better way of doing everything. Moving from the physical law of Moses to the spiritual law that was hidden from the carnal mind until God ushered in the "time of reformation." Everyone should know that when one "reforms" something, they drastically change it for the better, Notice how the dictionary definition compliments Christ's ministry; "reformation, to improve by alteration, correction of error, or removal of defects; to abolish abuse or mal-practice in government; put an end to wrong; cause a person to give up harmful or immoral practices; persuade to adopt a better way of life; correction of evils, abuses, or errors..." ( American Heritage). "That which is born of the flesh [that's all of us] IS FLESH [that too is all of us] and that which is born of the Spirit [are we now born of the Spirit? NO, and here's why...] ...that which is born of the Spirit IS SPIRIT" (John 3:6). Is anyone human flesh and at the same time SPIRIT? No, I think not. Jesus adds more proof of what it is like to be "born of the Spirit" - "The wind [Gk: pneuma-'spirit'] blows where it wishes, and you hear the sound thereof, but can not tell whence it comes, or whether it goes: so is everyone that is BORN of the Spirit" (Verse 8). Right there are three reasons why no one except Jesus has been born of the Spirit:  We are not composed of spirit,  We are not powerful like the wind,  Neither are we invisible like the wind. And so, we as Believers as "conceived" by the Spirit of God and have the "earnest" of His Spirit (Eph. 1:14), but we will not be born again (or anew) until we are resurrected with "incorruptible, glorified, powerful, SPIRITUAL bodies" - like the WIND (I Cor. 15:42-44). RESTITUTION: "Whom the heaven must receive until the times of restitution of all things, which God hath spoken by the mouth of all his holy prophets since the world began" (Acts 3:21). Strong's #605, "apokatastasis reconstitution, restitution. Also translated "restoration" and "establishment." Similar to our word "reformation." It involves giant changes in humanity. Restitution is not salvation. It is a precursor to Judgment : "When thy sisters, Sodom and her daughters, shall return to their former estate, and Samaria and her daughters shall return to their former estate, then thou and thy daughters shall return to your former estate" (Ezek. 16:55). Then these nations "...shall know that I am the Lord" (Verse 62). We are being changed now from our sinful ways as we learn to "...know that I am the Lord." REGENERATION: "And Jesus said unto them, Verily I say unto you, That ye which have followed me, in the regeneration when the Son of man shall sit in the throne of his glory, ye also shall sit upon twelve thrones, judging the twelve tribes of Israel" (Matt. 19:28). Strong's #3824, " paliggenesia (spiritual) rebirth (the state or the act), that is, (figuratively) spiritual renovation; specifically Messianic restoration: - regeneration." We are now involved in regeneration in our lives. It is the Sprit of God that regenerates us and renovates us into something good and useful in the Kingdom of God when Christ comes to judge the world in righteousness. TRANSFORMATION: II Cor. 3: "And be not conformed to this world: but be ye transformed by the renewing of your mind, that ye may prove what is that good, and acceptable, and perfect, will of God" (Rom. 12:2). Strong's #3339, " metamorphoo , to transform (literally or figuratively "metamorphose"): - change, transfigure." There is that word "CHANGE" once more. It is good to be "conformed," but to the Lord, not to this world. Paul explains this further: "But we all, with open face beholding as in a glass the glory of the Lord, are changed into the same Image from glory to glory even as by the Spirit of the Lord" (II Cor. 3:18). CONFORMATION: "And be not conformed to this world: but be ye transformed by the renewing of your mind, that ye may prove what is that good, and acceptable, and perfect, will of God" (Rom. 12:2). Strong"s #4964, "suschematizo, to fashion alike, conform to the same pattern." So negatively, we should not be conformed to this world, but on the positive side we should "...be conformed to the image of his Son, that he might be the firstborn among many brethren" (Rom. 8:29). Strong"s #4832 " summorphos, jointly formed, similar: conformed to, fashioned like unto. Think of how a ugly worm goes through metamorphosis and changes in to a beautiful butterfly. So we are changed, "summorphos," conformed from our carnal image to the glorious image of Christ. TRIBULATION: "...we must through much tribulation enter into the kingdom of God" (Acts 14:22). Strong's #2347, thlipsis, pressure (literally or figuratively): - afflicted, affliction, anguish, burdened, persecution, tribulation, trouble." Notice the first word of definition: "pressure." Everyone knows that pressure brings about changes. The pressure at the bottom of the sea will flatten a submarine like a pancake. But spiritual pressure (which often involves physical pressure) brings about drastic changes in our character, and produces the spiritual fruit of love, joy, peace, patience, gentleness, goodness, faith, meekness, self-control (Gal. 5:12-13). EXHORTATION: " And ye have forgotten the exhortation which speaks unto you as unto children, My son, despise not thou the chastening of the Lord, nor faint when thou art rebuked of him" (Heb. 12:5). Strong's #3874, " parakle ,sis, imploration, hortation, solace: comfort, consolation, exhortation, intreaty." Exhortation is a strong admonition or appeal. For what? Why for acceptance of the truth in Jesus Christ to CHANGE and be like Him in every way. ADMONITION : "And we beseech you, brethren, to know them which labor among you, and are over you [practice in front of you] in the Lord, and admonish you" (I Thes. 5:12). Strong's #3560, " noutheteo to put in mind, to caution or reprove gently: admonish, warn." Teachers are not "over" the congregation as the Church practices it, but rather are to be "practicing examples of what they preach." Paul said to "...be ye followers of me" (I Cor. 4:16). And of course, when we are not following correctly, we need to make CHANGES. The whole Old Testament Hebrew Scriptures were written and preserved for "our admonition" (I Cor. 10:11). For our caution against making the same mistakes and sins, and gentle reproving to correct areas of deficiency. EDIFICATION: "Let every one of us please his neighbor for his good to edification" (Rom. 15:2). Strong's #3619, " oikodome , architecture, that is a structure; figuratively confirmation : - building, edify." Believers are the Body of Christ, "God's building" (I Cor. 3:9), which is likened to a spiritual building which has spiritual architecture, and spiritual structure. We are to build up each other so as to strengthen and improve this structure. And it all involves constant CHANGE. SUPPLICATION: "Be careful for nothing ['don't worry about anything'] ; but in every thing by prayer and supplication with thanksgiving let your requests be made known unto God" (Phil. 4:6). Strong"s #1162, deesis, a petition: prayer, request, supplication." Prayer can involve many things, like thankfulness and praise, but supplication involves making a humble and earnest petition, to beseech, to beg. And our greatest needs are spiritual. INTERCESSION: "Likewise the Spirit also helps our infirmities: for we know not what we should pray for as we ought [to accord with what must be] : but the Spirit itself makes intercession for us with groanings which cannot be uttered. And he that searches the hearts knows what is the mind of the Spirit, because he makes intercession for the saints according to the will of God. Who is he that condemns? It is Christ that died, yea rather, that is risen again, who is even at the right hand of God, who also make intercession for us" (Rom. 8:26, 27, & 34). Strong's #1793, entugchano , "to confer with; to entreat: deal with, make intercession." To intercede is to PLEAD. The Catholics have their earthly priests to intercede with God on their behalf. How much better to have Jesus Christ, the Only High Priest, Who PLEADS to God for our welfare. Sometimes I think we don't even realize that we have a High Priest. "Wherefore in all things it behooved Him [Jesus] to be made like unto His brethren, that He might be a merciful and faithful High Priest in things pertaining to God, to make reconciliation for the sins of the people. For in that He Himself hath suffered being tempted [tried/tested] , He is able to succor [aid/relieve] them that are tempted" (Heb. 2:17-18). CONSOLATION: Same Greek word translated "exhortation." (II Cor. 1:6). PREDESTINATION: "Having predestinated us unto the adoption of children by Jesus Christ to himself, according to the good pleasure of his will...In whom also we have obtained an inheritance, being predestinated according to the purpose of him who works all things after the counsel of his own will" (Eph. 1:5 & 11). Strong's #4309, proorizo, to limit in advance, predetermine: determine before, ordain, predestinate." We are limited before our birth to do only what God has determined beforehand we must do. Therefore, what God has determined we must be, He will surely bring about, and this for sure involves many great changes in our lives. CONVERSATION: This one is a bit confusing to say the least. There are three different Greek words used for this word. Two are nearly synonymous, but the third is totally different. "For ye have heard of my conversation [Gk: 'behavior, Young's, Concordant; 'manner of life,' Rotherham's, New American] in time past in the Jews' religion, how that beyond measure I persecuted the church of God, and wasted it" (Gal. 1:13). This was the manner or behavior Paul had before conversion, before his change. "...but by the grace of God, we have had our conversation [Gk: 'we behaved ourselves,' Concordant, New American, Rotherham's, Young's etc.] in the world, and more abundantly to you-ward" (II Cor. 1:12). Before Paul's conversion he "wasted" the church, but now he is "behaving" himself in a godly manner and is an example to all. "For our conversation [Gk: 'citizenship,' Rotherham's Young's, New American] is in heaven [the heavens] ; from whence also we look for the Saviour, the Lord Jesus Christ" (Phil. 3:20). Now that Paul has changed his life, his realm of citizenship is in the heavens "from whence" his Saviour will bring this reward to Paul and all the Elect at the resurrection. SANCTIFICATION : " Sanctify them through thy truth: thy word is truth... That he might sanctify and cleanse it with the washing of water by the word, that He might present it to Himself a glorious church, not having spot, or wrinkle, or any such thing, but that it should be holy and without blemish" (John 17:17 & Eph. 5:26-27). Strong's #37, hagiazo, "to make holy, purify, consecrate, venerate, hallow, be holy, sanctify." Need I point out once more the enormous change that must be made in us. We are spiritually dirty and we need to be changed to something that is pure and holy. This we are told is accomplished by the Christ "washing us from our sins in His own blood" (Rev. 1:5), and "with the washing of water by the word." We are sanctified (set apart as something pure and holy) through the Truth, which is the Word of God, which Word is Jesus Christ and His blood. REDEMPTION: "In whom we have redemption through his blood, the forgiveness of sins, according to the riches of his grace... Which is the earnest of our inheritance until the redemption of the purchased possession, unto the praise of his glory" (Eph. 1:7 & 14). Strong's #629 apolutrosis, "ransom in full, (specifically) Christian salvation , deliverance, redemption." As sinners we are slaves to sin, and Jesus buys our freedom, our deliverance from sin, which deliverance when completed brings salvation. Ask any slave who has been freed whether there is not a gigantic change from slavery to freedom. Jesus sets us free and ultimately saves us. SALVATION: "For I am not ashamed of the gospel of Christ: for it is the power of God unto salvation to every one that believeth; to the Jew first, and also to the Greek... Receiving the end of your faith, even the salvation of your souls" (Rom. 1:16 & I Pet. 1:9). Strong's #4991 soteria, "rescue or safety, deliver, health, salvation." Perfect health and safety for all eternity. How great a change from what we are will that be? Everyone of these terms involves a change. Or what could be called, spiritual conversion-Converting from the carnal image of man into the spiritual Image of God. "For by grace are ye saved through faith... For we are His achievement, created in Christ Jesus unto good works..." (Eph. 2:8-10). Everything from our repentance to our salvation is the work of God in us through Christ Jesus. Broadly speaking all of these things are God's judgments (setting all wrong right) upon us. Some are severe while others are pleasant blessings, but they are all designed to fashion us into the spiritual Image of God, and they are all administered in righteousness. Every facet of our lives consist of changing or being put into a new position of change. Only God does not change. We are in need of dramatic and revolutionary change . "But we all, with open face beholding as in a glass the glory of the Lord, are changed into the same image from glory to glory, even as by the Spirit of the Lord" (II Cor. 3:18). "For the Father judges no man, but has committed all judgment unto the Son" (John 5:22). Some erroneously believe that if God were Sovereign and man had no free will, then God would force us to live righteously and godly; He would force us to love Him; He would force us against our will to do His will; and such utter nonsense. God forces no one to do His will. Which of the apostles was forced to do the will of God against his will? The unscriptural arguments against the Sovereignty are but smoke and mirrors of the theologians. "And He [Jesus] said unto them [Peter and Andrew] , Follow Me, and I will make you fishers of men. And they straightway left their nets, and follow Him" (Matt. 4:18-20). "And another of His disciples said unto him, Lord, suffer me first to go and bury my father. But Jesus said unto him, Follow me, and let the dead bury their dead" (Matt. 8:21-22). "And another also said, Lord I will follow you, but let me first go bid them farewell, which at home at my house. And Jesus said unto him, No man, having put his hand to the plough, and looking back is fit for the kingdom of God" (Luke 9:61-62). Jesus said unto him, If you will be perfect, go and sell that you have, and give to the poor, and you shall have treasure in heaven,: and come and follow Me. But when the young man heard that saying, he went away sorrowful, for he had great possessions" (Mat. 19:21-22). "And a certain scribe came and said unto Him, Master, I will follow you whithersoever You go. And Jesus said unto him. The foxes have holes, and the birds of the air have nests; but the Son of man has no where to lay His head" (Matt. 8:19-20). Jesus knew this upper class scribe would not be inclined to endure for very long. "Many there of His disciples when they had heard this, said, This is an hard saying; who can hear it? When Jesus knew in Himself that His disciples murmured at it, He said unto them, Does this offend you? What and if you shall see the Son of man ascend up where He was before? So today theologians and Christians would say that they are not offended that Jesus said we are to "eat His flesh and drink His blood," oh no, but they are terribly offended if one applies Jesus' very same spiritual words to such things as Gehenna fire showing that it too is nor literal fire. "It is the SPIRIT that quickens [gives life] ; the flesh profits nothings: the words that I speak unto you, they are spirit and they are life... but there are some of you that believe not... Therefore said I unto you, that no man can come unto Me except it were given unto him of My Father. From that time many of His disciples went back, and walked no more with Him"
Will any of you also "go back and walk no more with Him" after reading this Lake of Fire series? Does standing up for the Truths of Jesus Christ bring more persecution, condemnation, and ridicule from your "Christian" brothers and sisters than you are willing to endure? "If any man come to Me, and hate [love less] not his father, and mother, and wife, and children, and brethren, and sisters, yea, and his own life also, he cannot be My disciple"
"And whosoever does not bear his cross, and come after Me, cannot be My disciple"
"So likewise, whosoever he be of you that forsake not all that he has, he cannot be My disciple" (Luke 14:26, 27, 33). If you still think you want to be Christ's disciple, we will now go into how this must be accomplished according to the Sermon on the Mount and the four judgments including "Gehenna fire." "Blessed are the poor in spirit... they that mourn... the meek... they which do hunger and thirst after righteousness... the merciful... the pure in heart... the peacemakers... they which are persecuted for righteousness sake... you when men shall revile you, and persecute you... rejoice, and be exceeding glad: for great is your reward in the heavens" (Matt. 5:2-12). You [disciples] are the salt of the earth... ye are the light of the world..."
"To him that overcomes will I grant to sit with Me in My throne, even as I also overcame, and am sit down with My Father in His throne" (Rev. 3:21). "And he that overcomes, and keeps My works unto the end, to him will I give power over the nations" (Rev. 2:26). "Do you not know that the saints shall judge the world? ...know you not that we shall judge angels?" (I Cor. 6:2 & 3). "What shall we say then? Shall we continue in sin, that grace may abound? God forbid. How shall we, that are dead to sin [but just HOW do we get 'dead to sin?'] live any longer therein? Know you not, that so many of us as were baptized into Jesus Christ were baptized into His death? [THAT'S how we get 'dead to sin']. Therefore we are buried with Him by baptism into death: that like as Christ was raised up from the dead by the glory of the Father, even so we also should walk in newness of life" (Rom. 6:1-4). This "newness of life" means "led by the Spirit" of Jesus Christ IN US. But here's the problem with most Christians. Most Christians have been baptized in WATER, but they have never been "baptized into His DEATH." Therefore they write me weekly telling me how important this physical ritual of water baptism is, because they have never been SPIRITUALLY "baptized into the NAME of Jesus," or "baptized into His DEATH," and therefore know nothing of the spiritual meaning of these physical symbols. For this reason they also feel it most important to observe the physical ritual of Sabbath keeping, because they have not as yet "entered into His [SPIRITUAL] rest." ("For we which have believed DO ENTER INTO REST..." Heb. 4:3 ). For this reason they feel it most important to partake of a little grape juice and a wafer on a regular basis, because they have not as yet SPIRITUALLY "eaten His body or drunk of His blood" (John 6:54). "WHAT? Know you not that your body is the temple of the Holy Spirit which is in you, which you have of God, and you are not your own? For you are bought with a price: therefore glorify God in your body, and in your spirit, which are God's" (I Cor. 6:19-20). Therefore, since our bodies belong to God and ARE God's, we are to "... present our bodies a living sacrifice, holy, acceptable UNTO GOD [NOT Caesar's filthy tax money] , which is your reasonable [rational, intelligent] service. And be not conformed to this world, but be you transformed by the renewing ['walk in newness of life,' (Rom. 6:4), 'a new creature,' II Cor. 5:17, 'a new creature,' Gal. 6:15] of your mind, that you may prove what is that good and acceptable, and perfect will of God" (Rom. 12:1-2). For this reason they feel it most important to be physically circumcised in the flesh, because they have not as yet been circumcised "in heart and in spirit" (Rom. 28-29). For this reason they desire physical healing over spiritual healing, etc., etc. Sadly, the Church of Christendom knows little of Christ's "words of spirit." In Jesus' Sermon recorded in Matt. 5:21-26, Jesus was not teaching His disciples on the mount that they would be brought before the Judgment of the nation of Israel if they hated a brother; or that they would be brought before the High Council of the Jewish Sanhedrin if they called a brother Raca; or that they would be burned at the Jerusalem garbage dumped in the valley of Gehenna if they called a brother a fool; or that they would be thrown into a prison of the Roman Empire if they did not quickly rectify a grievance with a brother. It is nonsense to think such a thing. These are Jesus' Judgments for His disciples and followers through all ages. "For we must all appear before the judgment seat of Christ; that every one may receive the things done in his body, according to that he has done, whether it be good or bad" (II Cor. 5:10). "But why do you judge thy brother? or why do you set at naught your brother? for we shall all stand before the judgment seat [Gk: bema-- 'tribunal, dais] of Christ" (Rom. 14:10). "For it is written, As I live, says the Lord, every knee shall bow to Me, and every tongue shall confess to God. So then every one of us shall give account of himself to God." Do we for the first time appear before the dais of Christ when the rest of the world appears before His dais? No, of course not. If we blow our knee to Christ for the first time in the White Throne Judgment with the rest of the world, we won't be in the kingdom of God.We had better be "bowing the knee to Jesus" right NOW. "...Behold now is the accepted time; Behold, now is the day ['a day'-Rotherham, Diaglott, Young's, Concordant] of salvation" (II Cor. 6:2). "And the times of this ignorance God winked at; but now commands all men every where to repent" (Acts 17:30). "And that, knowing the time, that now it is high time to awake out of sleep, for now is our salvation nearer than when we believed" (Rom. 13:11). "Which in time past were not a people, but are now the people of God: which had not obtained mercy, but now have obtained mercy" (I Pet. 2:10). "For if we would judge ourselves [now] we should not be judged. But when we are judged, we are chastened of the Lord, that we should not be condemned [later] with the world [later in the Great White Throne Judgment]" (I Cor. 11:31-32). "For the TIME IS COME [now] that judgment must begin at the House of God..." (I Pet. 4:17). "...for the time is at hand" (Rev. 1:3 and 22:10). There can be no argument against the fact that God's Elect are to "bow their knee" NOW in this Church age or we will find ourselves in the next age when, "Because He has appointed a day in the which He will judge the world in righteousness..." Acts 17:31). During our calling, we stand before the Judgment of Jesus and give an account daily of the works done in our flesh. How do we actually do this? Paul instructs us: "For if we would judge ourselves..." (I Cor. 15:11:31). This is how we are to be judged. Notice how Paul's statement is in perfect agreement with that of Jesus: "And if your right eye offend you, [you] pluck it out... And if your right hand offend you, [you] cut it off..." (Matt. 5:29-30). "For if we would judge ourselves we should not be judged... we should not be condemned with the world" (I Cor. 11:31-32). In God's due time, all humanity will voluntarily desire with their whole heart to be a member of the Family of God. No one will be forced in or out of God's Family. HOW DO WE "EXCEED" THE RIGHTEOUSNESS OF THE PHARISEES? "But I say unto you, That except your righteousness shall exceed the righteousness of the scribes and Pharisees, you shall in no case enter into the kingdom of heaven" (Matt. 5:20). What did Jesus mean by exceed? He meant a lot. The Greek word translated exceed in this verse is from the Greek words: presseou, pleion, pleion, pleon which means "super abound, in excess, excel, over and above, more in number, quality, and quantity, major portion, above, exceed, more excellent, further, very great, greater, longer, very many." Wow! That's a pretty big commandment, don't you reckon? This involves a lot more than the Pharisees ever imagined. "But all their works they do for to be seen of men: they make broad their phylacteries, and enlarge the borders of their garments" (Matt. 23:5). 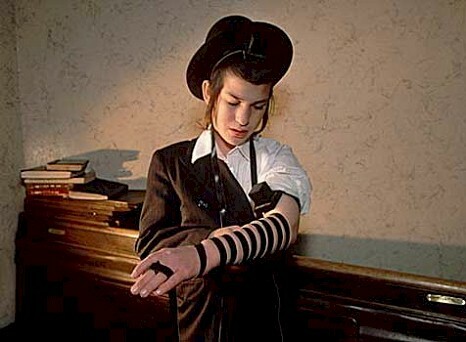 Wrapping phylacteries around his arm, a Hasidic youth in Brooklyn, New York, prepares for his morning prayers. Phylacteries, called tefillin in Hebrew, consist of two black leather boxes that are attached to leather ties; the boxes contain passages from Scripture written on parchment. Traditional Jews, including Hasidim, don phylacteries for prayer from the time of bar mitzvah (age 13) on. Brooklyn, a borough of New York City, has a large community of Hasidic Jews. Is God impressed with such physical, outward show of ritualism? Apparently not, seeing that our righteousness must exceed theirs to be accepted. "You have heard that it was said by them of old time, you shall not commit adultery..."
And there are many men who have been obedient to this part of the commandment. "But I say unto you, that whosoever looks on a woman to lust after her has committed adultery with her already in his heart" (Matt. 5:27-28). So what is a man to do? No viral man has the ability to NOT LUST after pretty women (and as Billy Crystal would have us know, sometimes not so pretty women). It is as natural as a knee-jerk, and if you women hear a different story from your husbands, know that they are lying through their teeth. All men lust after women. But it's a sin. Why is it a sin? Because Jesus said so. (And other reasons I don't have time to go into now). It's a sin and men are powerless to overcome it. What are we to do? Not even marriage will totally solve the spiritual aspect of this problem. But there is a way to conquer this and all sins. "But you shall receive power after that the Holy Spirit is come upon you..." (Acts 1:8). And so, when a man who is tempted to spend more time looking at a woman than he should, looking at her to lust after her, the Spirit of God will give him power to turn away. God won't make you or force you to turn away, but He will give you the power to turn away, and then you have to do the turning. And should you fail to turn away before you actually lust after her, then you must "pluck out your eye. No not your literal, physical, organ of the body, but the lustful eye of your heart. No man's physical eyes has ever lusted after anything. All lust comes from the heart, the carnal mind, and that part of the carnal mind must be "plucked out," or "cut off." But you must be the one who does the plucking and cutting or God will intervene and "cast your whole body into Gehenna fire" in a later Judgment where this spiritual fire is called "The Lake of Fire." We can either volunteer to stop sinning now, in this life, or God will volunteer us to stop sinning later, in the resurrection to Judgment. Yes, of course, it will be God in us regardless of which Judgment we find ourselves. Now we learn something very specific from Christ's statements regarding Gehenna fire in this Sermon on the Mount, but we must look very closely to see this truth. One of the ways that Jesus Judges His disciples is through spiritual "Gehenna fire." If one doesn't "pluck out an eye" or "cut off a hand," the result will be that "your whole body should be cast into hell [Gehenna fire] " (Matt. 5:30). Read it carefully now: By not plucking out one's eye or cutting off one's hand, the result is that one's whole body is cast into Gehenna fire. What then does plucking out an eye or cutting off a hand represent, but the fact that only part of one's body at a time is being destroyed in Gehenna fire. We can either have the different parts of our carnal mind burned by this spiritual Gehenna fire, and reign with Christ, or we can have our whole body burned by this Gehenna fire and miss out on reigning with Christ. And so we have proof from this very verse that spiritually plucking out an eye or spiritually cutting off a hand or foot, IS spiritually being purged by Christ's spiritual Gehenna fire! That is what Gehenna fire represents-the spiritual judging and correcting of the human heart and carnal mind. This is what spiritual overcoming is. If we learn to spiritually overcome our own carnal being, then Jesus will use us to bring all the nations (Rev. 2:26-27) of the world into this same saving grace through the consuming fire of His Spirit and our Spirit seeing that "Our God is a consuming fire" (Heb. 12:29), and God makes "...His ministers [that's US, God's Elect] a flame of fire" (Heb. 1:7). Are the Judgments of Jesus beginning to make practical, logical, spiritual sense to your mind? Can you begin to think with the Mind of God wherein "Mercy triumphs over Judgment" (James 2:13, Emphatic Diaglott)? We do not need to have our "whole body cast" into the Gehenna lake of fire in the "condemnation of the world" (I Cor. 11:31-32), if we will but be merciful to all sinners as God is being merciful to His Elect now; not as the Church which delights in doctrines of eternal torture on those they fancy are their enemies. For those Christians who show no mercy for the billions that they consign to an eternity of inhumane and insane torture in fire, "...He [God] will have judgment without mercy, that have showed no mercy" (James 2:13). They will all have their "whole body...cast into the lake of fire" (Matt. 5:30 & Rev. 20:15). Does this portray what Jesus had in mind when He said that whole bodies would be cast into Gehenna fire? Hardly. IS THERE ETERNAL FIRE AND IMMORTAL WORMS IN GEHENNA? "And if your hand offend you, cut it off: it is better for you to enter into life maimed, than having two hands to go into hell [Gk: 'Gehenna'], into the fire that never shall be quenched:  Where their worm dies not, and  the fire is not quenched." "Because they have forsaken me, and have burned incense unto other gods, that they might provoke me to anger with all the works of their hands; therefore my wrath shall be kindled against this place, and shall not be quenched" (II Kings 22:17 & II Chron. 34:25). Did that fire that "shall not be quenched," burn eternally? Is it still burning in Jerusalem today? NO. "And the streams thereof shall be turned into pitch, and the dust thereof into brimstone, and the land thereof shall become burning pitch. It shall not be quenched night nor day; the smoke thereof shall go up for ever: from generation to generation it shall lie waste; none shall pass through it for ever and ever" (Isa. 34:9-10). Let's get real for a moment shall we. If this fire was to never be quenched because it was eternal and endless, just how do we explain the fact that God said there would be owls, porcupines and hedgehogs living there (Verse 11)? And that there would be thorns in her palaces, nettles and brambles in the fortresses growing quite nicely (Verse 13)? Do these plants not burn in fire? Do wild animals and birds like living in fire and smoke? "See you not what they do in the cities of Judah and in the streets of Jerusalem? The children gather wood, and the fathers kindle the fire, and the women knead their dough, to make cakes to the queen of heaven, and to pour out drink offerings unto other gods, that they may provoke me to anger. Therefore thus says the Lord GOD; Behold, mine anger and my fury shall be poured out upon this place, upon man, and upon beast, and upon the trees of the field, and upon the fruit of the ground; and it shall burn, and shall not be quenched" (Jer. 7:17-20). Well what have we here. If this not to be quenched fire is eternal, then we finally have a verse of Scripture that affirms that "the children" will be burned along with the men, beasts, trees, and fruit. Not only do Christians believe in "immortal souls, and "immortal worms," but now we have immoral beasts, trees, and fruit that supposedly will burn in this not to be quenched fire for all eternity. Listen, it matters not if one contends that a few of these prophecies are for the yet future, or that they have been all totally fulfilled as Preterists contend. If they have already been fulfilled, and fires not quenched, are endless and eternal, then those fires kindled way back BC must STILL BE BURNING, but they are not still burning. And if this is a Futurists prophecy yet to be fulfilled, then we are faced with torturing not only immortal beasts, trees, and fruit, but CHILDREN as well. Am I going to fast for anyone? Maybe it's time to come out of Babylon. "But if ye will not hearken unto me to hallow the sabbath day, and not to bear a burden, even entering in at the gates of Jerusalem on the sabbat h day; then will I kindle a fire in the gates thereof, and it shall devour the palaces of Jerusalem, and it shall not be quenched" (Jer. 17:27). Again we ask: are the gates of Jerusalem still burning today? Or will the physical wooden gates of Jerusalem burn forever? Eternally? Do we now have Scriptural proof for "immortal wooden gates?" "And say to the forest of the south, Hear the word of the LORD; Thus says the Lord GOD; Behold, I will kindle a fire in thee, and it shall devour every green tree in thee, and every dry tree: the flaming flame shall not be quenched, and all faces from the south to the north shall be burned therein. And all flesh shall see that I the LORD have kindled it: it shall not be quenched" (Ezek. 20:47:48). More immortal trees? And how can they burn forever when they are devoured?-'burn up, consume, devour' (Strong's #398). In every instance of fire not quenched in Scriptures, it never stands for endless or eternal fire, burning immortal wood, immortal trees, immortal fruit, immortal beasts, immortal children and immortal men. Why then should we think that Jesus was speaking of "immortal" worms that die not and endless eternal fire not quenched? (Mark 9:44). It's unscriptural and it is absurd. "Even as Sodom and Gomorrah, and the cities about them in like manner, giving themselves over to fornication, and going after strange flesh, are set for an example suffering the vengeance of ETERNAL FIRE" (Jude 7). Well there it is: Sodom and Gomorrah and all the cities of the plain are suffering the vengeance of ETERNAL fire. Or are they? This is the only time "eternal" fire is used in the King James, however, "everlasting" fire (translated from the same Greek word aionios ) is used twice (Matt. 18:8 and 25:41). Now then, how could it be endless or eternal, seeing that the area of Sodom and Gomorrah and that whole plain on which there were multiple cities, are not on fire today? Nor was it on fire in Christ's time, or in Israel's time, or in any time since Abraham. The Greek word aion, translated "eternal" and "everlasting" in these verses means "age" or pertaining to an age. Neither the Hebrew nor the Greek manuscripts had a word that can be properly and accurately translated as either "eternal" "everlasting," or "endless time" (in fact, authorities have stated that no language on earth before the second century AD had a single word that mean "eternity" or "endless time.") Eonian or age-abiding fire is decidedly not eternal, never-ending fire. "Now no chastening for the present seems to be joyous, but grievous: nevertheless afterward it yields the peaceable fruit of righteousness unto them which are exercised [trained] thereby" (Heb. 12:11) . The "eternal fire" of Jude 7 is no longer burning in Sodom and Gomorrah, seeing that it was not "eternal" but "eonian" and therefore is no longer burning. Many natural forest fires through history have never been quenched, but they are no longer burning. The fire from God in Jerusalem as recorded in Jer. 17:27, likewise is no longer burning, Yet it was not extinguished. They burned themselves out. It merely means that these fires will not be put out or extinguished, or quenched, but will cease upon completion of their purpose. So also is the case with their "worms that die not." There was fire and worms in the garbage dump of Gehenna, and they both had a part to play in the destruction of the flesh of animals and dead criminals (plus other garbage). But none were immortal or eternal. One stupid web site on the subject of hell, which people send me continually, states that the long 6 foot tube worms at the bottom of the ocean found around smokers (vents from subterranean lava), are the worms of hell which they say is under the crust of the earth. Nonsense, the worms of these Scriptures are specifically identified. The word "worm" appears in most bibles three times in Mark 9. However, Mark 9:48 is the only time it appears in the earliest and best Greek manuscripts. Mark 9:44 is spurious, and Mark 9:45b ( "...into the fire that never shall be quenched") and 9:46 are all spurious. The one time it is used in verse 44, it is a quotation from Isa. 66:24. Worm is translated from the Hebrew word Itola, and is defined as "a maggot." It's one time use in the Greek is from skolex, and also is defined as 'a maggot.' These are not tube worms at the bottom of the ocean, but rather maggots. And as any school boy knows, maggots are not immortal, but rather in a few short days turn into common house flies, which then lay more eggs on garbage, produce more maggots which then produce more flies to lay more eggs... And hence, they do not die [out] but just keep reproducing over and over. I am sure that some of the flies at your last picnic may have been descendants of the very maggots of which Jesus spoke of from the Gehenna city garbage dump at Jerusalem. Now then, what was the purpose of these maggots and fire in the valley of Gehenna? To destroy that which is putrid and worthless; to purge; to purify the city of its garbage. That was their physical purpose and Jesus has the same thing in mind when He uses these symbols, word pictures, and analogies to represent His spiritual sin-purging judgments. We know that Peter said, "For the time is come that judgment must begin at the House of God..." (I Pet. 1:17); and that Paul said, "For if we would judge ourselves..." (I Cor. 10:31); and Jesus said that we ourselves must "Agree with our adversary quickly," and we ourselves must "pluck it [our eye] out and cast it from us," etc. But do all these things constitute being judged by "worms and fire?" Absolutely. Gehenna fire does not represent eternal torture in literal flames upon the wicked. It represents cleansing and purging of His called and chosen Elect, now, in this Church age. "I beseech you therefore, brethren, by the mercies of God, that you present your bodies a living sacrifice, holy, acceptable unto God..." (Rom. 12:1). And just what is it that Jesus will do to all and every "sacrifice?" And just "who" is the everyone of this verse? Read the previous verse. The everyone is all those for whom "... their worms dies not and the fire is not quenched" (Verse 48). And just "who" is the their of this verse? Read the previous verse. The their is "And if thine eye..." The thine is YOU. You are the thine, and the their, and the everyone which shall be "...salted with fire." And just when will this fire of which Jesus spoke, start burning? "I am come to send fire on the earth; and what will I, if it be already kindled?" (Luke 12:49). "Fire, came I to cast upon the earth,-and what can I wish, if, already, it hath been, kindled?" (Rotherham). This spiritual Gehenna purging and purifying fire of Christ was already kindled when He called His disciples, and it has been with us ever since, and I can personally testify that it is with us today in every life that Jesus is purging from the rotten flesh of the carnal mind. Sermon on the mount: Matt. 5:22, 29, 30; 18:9 are all the same one occasion. Warning the apostles Whom to fear: Matt. 10:28 & Luke 12:5 are both the same one occasion. Offending little ones: Matt. 18:9 [see also 8] & Mark 9:43,45,57 are the same one occasion. Upbraiding the Pharisees: Matt. 23:15 & 33 are both the same occasion. (James 3:6 uses Gehenna making 12). "...but whosoever shall say, Thou fool, shall be in danger of hell [Gehenna] fire" (Matt. 5:22). Now we already discussed the absurdity of being tortured in literal fire for all eternity (as Christian orthodoxy teaches) for calling a brother "fool." It is not, in fact, as egregious a sin as is calling a brother raca, which carries a rather benign penalty of being brought before the Council. "And if thy right eye offend thee, pluck it out, and cast it from thee: for it is profitable for thee that one of thy members should perish, and not that thy whole body should be cast into hell [Gehenna] . This is the very same penalty for calling a brother fool. Mark well what Jesus is saying. One does not avoid Gehenna by plucking out one's eye. 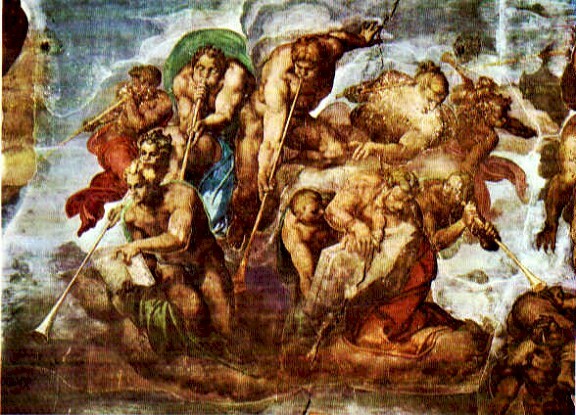 No, not at all, that plucking out or cutting off of one member IS GEHENNA FIRE, but it can be handled one member at a time, whereas to not deal with these sins when they arise will result in ALL of the person being "cast" into this purging spiritual fire of Gehenna, and God won't ask you if you want to volunteer first. "...for it is profitable for thee that one of thy members should perish, and not that thy whole body should be cast into hell"
"And fear not them which kill the body, but are not able to kill the soul: but rather fear him which is able to destroy both soul and body in hell [Gehenna] . "But I will forewarn you whom ye shall fear: Fear him, which after he hath killed hath power to cast into hell [Gehenna] ; yea, I say unto you, Fear him." Luke's account is the same as Matthew's, however, it is a shorter version. From Matthew we learn that God is "able to destroy" our very soul in Gehenna. But that is not a wicked thing, but a good thing. It is a good thing to loose (apollumi-destroy) our carnal soul for God's sake, and this destruction of the soul for God takes place in Gehenne. See Matt. 10:39 losing (destroying, "mortifying the deeds of the body" Rom. 8:13) takes place in spiritual Gehenna, Verse 28. "Wherefore if your hand or your foot offend thee, cut them off, and cast them from you: it is better for you to enter into life halt or maimed, rather than having two hands or two feet to be cast into everlasting [eonian] fire. And if your eye offend thee, pluck it out, and cast it from you: it is better for you to enter into life with one eye, rather than having two eyes to be cast into hell [Gehenna] fire" (Matt. 18:8-9). "Then shall he say also unto them on the left hand, Depart from me, ye cursed, into everlasting [Gk: 'aionios/eonian' or 'age-abiding'] fire, prepared for the devil and his angels" (Matt. 25:41). And so Matt. 18:8 is a pivotal Scripture in our understanding of Gehenna fire, everlasting fire, and lake of fire. The spiritual Gehenna fire, is the very same eonian fire which are used to Judge Gods people-the House of God. Then Jesus tells us it is also the very same fire that will be used to Judge Satan's messengers. And these messengers/angels of Satan are his "transformed" [Gk: metasche matizo, , 'disguised'] ministers of righteousness: "Therefore it is no great thing if his ministers also be transformed as the ministers of righteousness; whose end shall be according to their works" (II Cor. 11:15). All of Satans ministers-the deceived clergymen of the Church, MYSTERY BABYLON THE GREAT, MOTHER OF HARLOTS AND THE ABOMINATION OF THE EARTH, will not be judged until the Resurrection to Judgment at the Great White Throne, and that Judgment is in The Lake of Fire. Thus we now have it on the authority of Jesus Christ, that Gehenna fire, eonian fire, and lake of fire, are all the same spiritual fire of God, seeing that "Our God is a consuming fire" (Heb. 12:29), and God does not change. Jesus says that Gehenna fire is eonian, not eternal. And the ministers of Satan will go into this eonian fire. Now then if the fire is eonian for us, then it is likewise eonian for them. We only go through God's Gehenna/eonian fire for our eon, our life. A man's life is an eon, his eon. So eonian fire cannot be eternal, or we, God's chosen Elect, would go through Gehenna fire for all eternity. Now then, since it is only a temporary fire for us, the very SAME fire can be only temporary for the rest of humanity as well. Truly, the Scriptures do not contradict. On the very same occasion recorded in Mark 9, we have two more additions to this teaching: The mention of "their worms die not," and "everyone shall be salted with fire." We already discussed the meaning of these worms earlier in this paper. But this added phrase of our Lord is very instructive. Notice again that Jesus is speaking to His twelve apostles (Mark 9:35), not the multitudes. So, when He states that, "everyone shall be salted with fire" in Verse 49, He is telling His Apostles that THEY will be salted with fire. Hence this Gehenna fire cannot be eternal, but it is good, "Salt IS GOOD" (Verse 50). This is admittedly a strange phrase, as technically we do not "salt" anything "with fire." It is a kind of play on words. As we salt food to bring out its best, so God will salt us with fire, to bring out our best. But once more, it is not eternal torture, it is temporary purification. "You serpents, ye generation of vipers, how can ye escape the damnation of hell [Gehenna] ?" This one might seem a little more severe on the surface than the others, but it's not. In the first verse Jesus says that they turn their proselytes into children of hell or Gehenna. Let's think about that for a moment. I have now been accused, literally hundreds of times, of leading people into hell, and that I will receive so much greater punishment and damnation from God for leading "others" into hell. Imagine that? One person can be responsible for, and the single cause of another person loosing their salvation and then being tortured in literal fire for all eternity, and God can't or won't do anything about it. I guess it's just a matter of being at the wrong place at the wrong time. If all those hundreds of thousands of people had just not come to our site for some reason, they would then be saved, but now they are being lead into the eternal torment of an eternal hell. What a Christian crock. Imagine the mother and father of such a person that would be consigned to an eternity of torture because of my false and deceitful teachings, asking God why He didn't close me down? or prevent their daughter from coming to my site? or protecting them from being deceived by me in the first place? How hard could that be for God Almighty to save a precious son or daughter from being deceived by me? But no, it is assumed that I outsmarted God, and conquered one of His dear Sons or Daughters, and became the sole reason for them loosing their salvation. What do you suppose God would say to such a scenario? Well as it will not and cannot happen, we don't need to surmise such utter unscriptural nonsense. Did the Pharisees encompass land and sea to make one proselyte and then turn that convert in a "child of Gehenna?" Yes, of course they did, Jesus said they did. But will that "child of Gehenna" loose salvation and be tortured eternally in some Christian hellhole of fire because they were outsmarted by these Satan-inspired clergymen? Of course not. Not only will those the Pharisees deceived and turned into children of Gehenna not loose salvation, but this hypocritical blind leaders of the blind will not loose salvation either. Verse 33 tells us how they will be saved. They will be saved by "the DAMNATION of Gehenna." What is this damnation? It is JUDGMENT. We have gone over this many times in our "Lake of Fire" series. The word "damnation" is from the Greek word, krisis, and it means "tribunal, justice, accusation, condemnation, damnation, JUDGMENT." What specific judgment is Jesus talking about? Why the damnation of JUDGMENT OF GEHENNA. Is not this "judgment" then an evil thing? No, it is a RIGHTEOUS thing! It's just that the old English word "damnation" sounds so terrible and awful, when it is not. "Because He hath appointed a day, in the which He will judge the world in righteousness by that Man [Jesus] Whom He hath ordained; wherein He hath given assurance unto all men, in that He hath raised Him from the dead." "Woe unto you, scribes and Pharisees, hypocrites! for ye pay tithe of mint and anise and cummin, and have omitted the weightier matters of the law, judgment [Gk: krisis] , mercy, and faith: these ought ye to have done, and not to leave the other undone" (Matt. 23:23). Look at the company this word krisis keeps: " righteousness, assurance, mercy, and faith." Oh how the Church has perverted the simple and righteous words of God. Jesus upbraided the Pharisees for not exercising proper krisis/judgment with Israel. Listen: to judge, is to set things right. Men can only make feeble attempts at doing this properly, but I assure you that when God Almighty sets His hand to "set things right," they WILL BE SET RIGHT! Just as God has brought many of us to our knees for the sins we have committed, so will God bring this whole world to its knees. It will be emotionally traumatic and painful, but it will be a good thing. Men will be forced to look at themselves with open spiritual eyes, and they will HATE what they see. They will eventually desire with their whole heart to be cleansed and rid of all these carnal ways. The Apostle James proves all that Jesus said with regards to Gehenna/hell fire. "And the tongue is a fire, a world of iniquity: so is the tongue among our members, that it defiles the whole body, and sets on fire the course of nature; and it [the tongue] is set on fire of hell [Gk: gehenna]. " "My brethren, be not many masters [teachers] , knowing that we shall receive the greater condemnation [Gk: krima, condemnation, judgment] " (James 3:1). "For in many things we [James includes himself] offend all. If any man [including himself] offend not in word, the same is a perfect man, and able also to bridle the whole body" (James 3:2). It is the "words" that are spoken by the "tongue" that will come into Judgment. "But those things which proceed out of the mouth come forth from the heart; and they defile the man. For out of the heart proceed evil thoughts, murders, adulteries, fornications, thefts, false witness, blasphemies: these are things which defile the man" (Matt. 15:18-20). "But I say unto you, That every idle word that men shall speak, they shall give account thereof in the day of judgment" (Matt. 12:36). "O generation of vipers, how can ye, being evil, speak good things? for out of the abundance of the heart the mouth speaks" (Matt. 12:34). And what does Jeremiah tell us is the disposition of the universal heart of man? "The heart is deceitful above all things, and desperately wicked [Heb: 'exceedingly weak'] : who can know it?" (Jer. 17:9). Jesus used the examples of our eyes, hands, and feet that are used as instruments of offense, and must therefore be spiritually cut off. And this spiritual cutting off occurs in Gehenna fire." A literal very small bit in a horses mouth can turn the whole body of the beast, with very little effort (James 3:3). A literal very small helm [rudder] can turn great ships in fierce winds, with very little effort (Verse 4). A literal little fire can burn a great amount of material, even a whole forest, with very little effort (Verse 5). And so the metaphor, "the tongue is a fire," (the tongue is not a literal fire), means that it is like a literal fire in certain ways. What ways? "the tongue is a fire, a world of iniquity" and it  "defiles the whole body" and  "sets on fire the course [wheel] of nature" (Verse 6). The phrase " course of nature" is translated as "the wheel of our natural life" by Rotherham's Emphasized Bible, and as "the wheel of our lineage" by The Concordant Literal New Testament. The meaning is something like Elton John's song "The Circle of Life" from Disney's, The Lion King. And James informs us that no man can tame this little monster called the tongue. For if he could, then he would be " a perfect man, and able to bridle [to curb, conquer, and control] the whole body" (Verse 2). And what is the solution to bridling the tongue (which speaks for and in behalf of the deceitful "heart")? Why to "fight fire with fire." Set the tongue on fire with Gehenna fire-Gehenna JUDGMENT! (Verse 6). Right there is the solution to the whole enigma of what is Gehenna fire; what is eonian [falsely called everlasting] fire; and what is the LAKE of fire. Gehenna fire is first and foremost for Christ's disciples (the Elect), and is first taught by Jesus on the sermon on the mount to His disciples. It is therefore not literal fire, nor is it everlasting fire. "Gehenna fire" (Matt. 18:9 is also called " eonian [NOT 'everlasting'] fire" in Matt. 18:8, and also in Matt. 25:41 where this eonian fire prepared for the devil and his ministers will be judged in the resurrection to Judgment in "The Lake of Fire" (Rev. 20:15 & 21:8). The Gehenna fire, eonian fire, lake of fire, are all the Judgment of God. These fires are all the same ONE fire that come from the same ONE God, and "Our [One] God is a consuming FIRE" (Heb. 12:29). And so Gehenna fire has nothing to do with eternal torture, but rather with eonian chastisement and Judgment-for the House of God's elect, now, and for those who obey not the Gospel of God, in the Judgment of Gehenna/lake of fire, later. "I counsel thee to buy of me gold tried in the fire, that you may be rich; and white raiment, that you may be clothed, and that the shame of your nakedness do not appear; and anoint your eyes with eye salve, that you may see. To him that overcomes will I grant to sit with Me in My throne, even as I also overcame, and am set down with My Father in His throne. He that hath an ear, let him hear what the Spirit says unto the churches"